Junior Sanchez is the main member of the crew. He started it together with Armand van Helden and has since then spend the most time on the project. Junior met Armand back in 1992 when Junior was still working for the Rufftrax label. Before he released his first record in 1996 he was already known in the New York club scene for his dj gigs. But his big break as a producer came with the club hit 'B With U' wich he recorded with vocalist Dajae. In the past he has collaborated with many other members of Da Mongoloids crew such as: Rhythm Masters, Laidback Luke, Roger Sanchez and DJ Sneak. But he mainly worked together with Harry 'Choo Choo' Romero under the 'Nitebreed' pseudonym. For the past years his main priority has been running his own label called Cube Recordings. While he used to produced more club-house, lately his style has moved to techno and electro. In 1997 he did a dj tour together with DJ Sneak and Roger Sanchez under the name S-Men. Today he's still djing around the world and he has a residency at the Centro-Fly club in New York. He also released a few mix albums, the latest one was released last year. 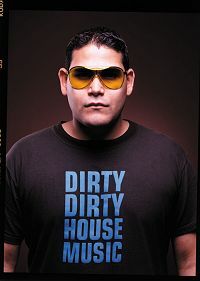 On this album called 'Dirty Dirty House' he shows that techno and electro are the style of his dj sets at the moment as well.